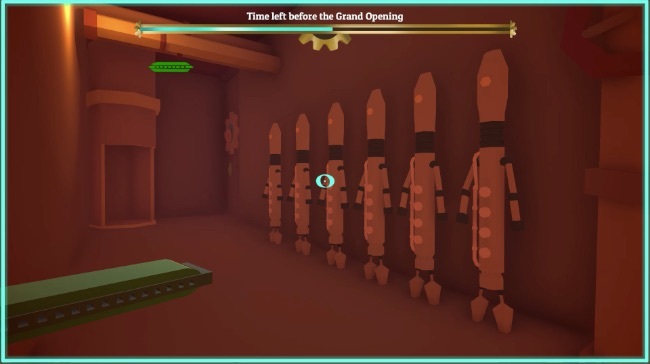 In FPS: The Musical you are a one man band who is in a rush to get to the Turbo Fessibile Automations Parade – the biggest festival of technology in the entire world! Unfortunately all the automated robotic instruments that are supposed to be in the parade are all inactive in their warehouse so you need to wake them up and get to the parade in time before it starts. Being a one man band means you have a selection of different musical instruments with you – a guitar, a harmonica, a trumpet and a drum. Each instrument is used to wake up a different type of robot and you also use them to shoot out musical codes to open doors. You really have to be fast too – there’s a long way to go to the parade and you only have a short time to get there. It takes a few minutes to get to grips with the mechanics, but once you figure it out FPS: The Musical is a great little musical adventure. It’s fun figuring out which instruments to use to wake up robots and open doors as you make your mad dash for the parade. You’ll need to be a super fast one man band to make it to the parade in time though! Note: FPS: The Musical is set up for an AZERTY keyboard by default. You can reconfigure it to traditional WASD controls in the Unity launcher though. It’s also highly recommended to check out the tutorial before playing the main game as it can be a little confusing otherwise.